Bright eyes and bright stars dance in the evening sky as Mother Owl and two babies scope the landscape from their perches in a stout tree. A third baby sleeps nestled snugly in the mother’s wing. Finished size is 13" x 15". 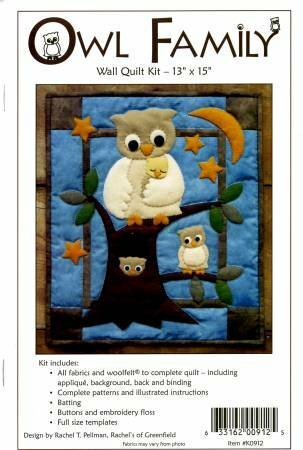 Kit includes all wool felt for applique, all fabrics (100% cotton) for background, borders, back, and binding, batting, buttons for eyes, embroidery floss, precise patterns and complete instructions. Colors are blue, brown, gold, green, oatmeal, putty, sand, and white.